The North American Arctic Transect addresses the Greening of the Arctic (GOA) themes of Current State, Change, and New Frontiers. Objectives: (1) Create a legacy dataset of baseline information along the North American Arctic Transect (NAAT) that represents the full range of zonal vegetation types in the Arctic. (2) Coordinate the science and data management of numerous projects interested in using the NAAT within the context of IPY. 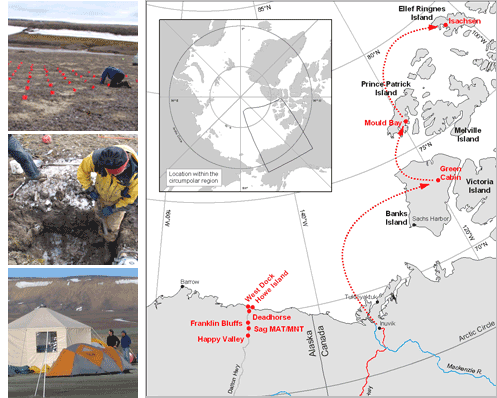 (3) Communicate the results of the studies through a three-part education/outreach component that includes an Arctic Field Ecology course, contributions to a new “Arctic Geobotanical Atlas” web site, and a field trip for the 9th International Conference on Permafrost. The biomass data are critical to understanding the causes of a recent large increase the greenness of the Arctic that has been detected with satellite-based sensors. Biomass, leaf-area, spectral data and other site information will be collected from each site to provide a baseline against which to monitor future changes. The NAAT will be a component of the Arctic Observing Network (AON) affiliated with the flagship observatory at Toolik Lake, AK. The project will serve as a magnet for other studies interested in examining all aspects of change along the Arctic climate gradient.